Wales centre Jonathan Davies has been ruled out of the Rugby World Cup by a knee injury. Davies, 27, ruptured his anterior cruciate ligament playing for his French club Clermont Auvergne against Montpellier on Saturday. The Welsh Rugby Union says the 2013 British and Irish Lion will undergo surgery in the next few days. 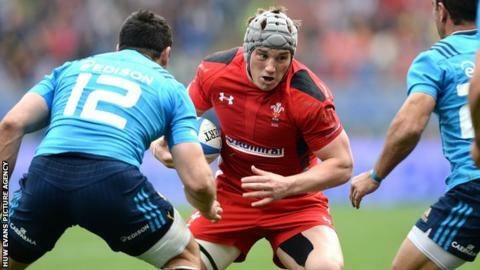 It is estimated Davies, who has won 48 caps for Wales, will be out of action for six to seven months. Wales head coach Warren Gatland said: "It's a disappointment for Jonathan and for us, but the advice is for him to have the surgery straight away. "Obviously the injury rules him out of the 2015 Rugby World Cup but our focus is his long term career and we will be working closely with him during his recovery looking towards the 2016 Six Nations." Davies has been first choice in Wales' midfield alongside Jamie Roberts. His injury could now present an opportunity for Scarlets back Scott Williams, who pushed the pair hard for a starting place during the 2015 Six Nations. Davies' injury also means Newport Gwent Dragons centre Tyler Morgan has been withdrawn from Wales' World Under-20 Championship squad and will be included in the extended senior World Cup training squad, which will be announced next month. Morgan, 19, was part of the 2015 Six Nations squad and in December 2014 became the first uncapped player to receive a Wales dual contract. "Although we are disappointed by the injury to Jonathan Davies we are delighted to have a player of Tyler's calibre and potential to call on," said Gatland. Wales have previously played Northampton wing George North at centre and could also call on Morgan's Dragons midfield partner Jack Dixon or Cory Allen. Cardiff Blues centre Allen, 21, has won two caps, the last of which was as a replacement in the 33-28 defeat against Australia in November 2014. Wales will face hosts England, Australia and Fiji in Group A after an opening game against Uruguay on 20 September in Cardiff. Gatland's side will prepare for the tournament with training camps in Switzerland, Qatar, Poland and north Wales. They then play warm-up matches against Ireland at home on Saturday, 8 August and in Dublin on Saturday, 29 August, before facing Italy in Cardiff on Saturday, 5 September.